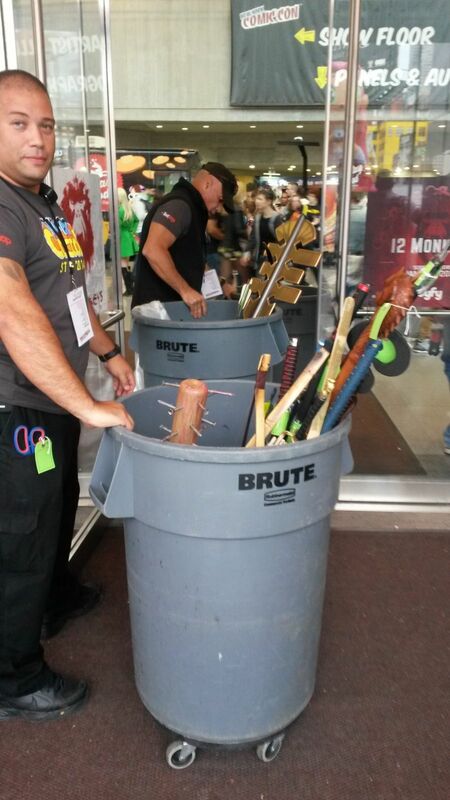 NYCC Janitorial staff cart away confiscated props. 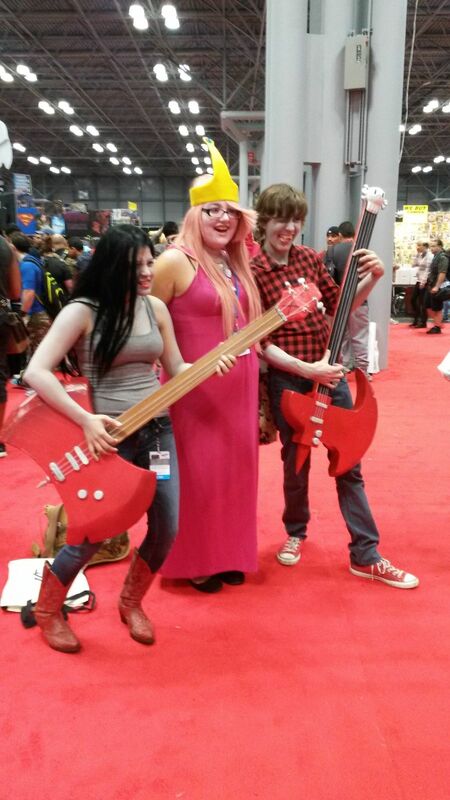 The 2014 New York Comic Con kicked off on Thursday and the costumes so far have been lackluster or just lacking that extra something. Perhaps that extra something would be an expensive prop with several hours of work poured into it? As I suspected, NYCC’s new prop policy of “don’t be an idiot” and “no weapons” has been causing confusion and disappointment. Thursday is perhaps the slowest day of NYCC, what will Friday and Saturday bring? Reports of trash cans filled with wooden props floated around by word of mouth and across the internet. On my way to NYCC I refused to believe that people were actually throwing out their props because they didn’t adhere to the new prop policy. I would imagine, with all of the money ReedPop makes from ticket sales, they could at least have a consistent weapons/prop policy and a prop check for people who have been told their prop does not meet safety standards. Now, at first I would imagine ‘weapons’ rules would refer to ‘weapons’ – like swords, blunt objects, etc… but I’m seeing items in the trash that don’t even resemble weapons, like big plastic keys. 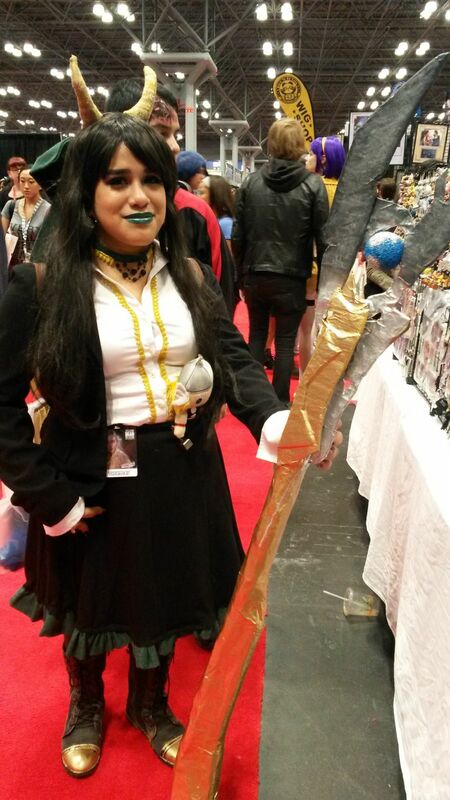 As you may have seen from my previous update, I have been told that I can bring my Sailor Pluto time key staff, but after seeing the trash cans at NYCC today, I’m really not interested in taking chances. I would also like to note, for those readers who have reported that plastic guns with orange caps were not allowed, I saw an abundance of them today on the show floor. Before you say “but look, there is a bat in the garbage! Duh you can’t bring that in,” the janitor was nice enough to stop so I could get a clear picture. That bat is made out of plastic and the nails were floppy rubber. Nobody was getting hurt with that bat. Next to the bat is a wooden bow. Why would you confiscate a wooden bow that isn’t actually functional? There is also an assortment of toy swords in the trash as well. Behind it, in the other can you can see a large plastic prop… something that clearly doesn’t look like a weapon or capable of any real damage if it hit someone. A mixed media prop that survived Citadel Security. I wandered around the show floor for quite a bit to see if I could find any props that go against NYCC’s new “don’t be an idiot” policy and indeed I did find some made out of mediums that do not fit into the foam or cardboard category. A nice cosplayer with a very large prop took the time to explain to me that her prop wasn’t examined and that she believed wood props were okay to bring into the convention. This speaks of the obvious – ReedPop did not do a good job of making the new policy public. Wood does not fall into the category of foam or cardboard. Kudos to her for getting this past the weapons check table. Whoever screened her was probably in a good mood. It is also important to note that while some people had their bows and arrows confiscated and tossed into the trash, some people did have wooden bows and arrows on the show floor. This means that there is a complete lack of communication between New York Comic Con staff and Citadel Security, the independent company contracted out to enforce policies and keep convention goers “safe.” If indeed props made of mixed media using wood, paster, etc, are allowed into the convention and the foam/cardboard rule only applied to “weapon” type props such as swords and knives, why wouldn’t NYCC make sure Citadel was aware of the difference? On my way to the convention I saw a disappointed Cloud cosplayer with an amazing wooden prop. He was heading home because he had no plans of putting his detailed and well done prop in the trash. I don’t blame him. If anything this is a huge fail in NYCC’s already filled up book. A lot of people are simply tired of attending NYCC because of poor and disorganized policies, inflated prices, lack of panels targeted towards niche nerd hobbies, and the demise of New York Anime Fest. Will NYCC address this issue next year and made a more thought out prop policy to keep the cosplay community in attendance? Or will they simply disregard the fans as they always seem to do because people will purchase tickets regardless of if they are getting a bad deal. It is amazing how NYCC can create the “Cosplay is Not Consent” policy while finding a way to deter cosplayers from even going to the convention at all. I don’t know about you, but I plan to keep my larger props at home. They can go to Otakon. I’m not taking a chance that I’ll have to leave my in the trash or take it back home.